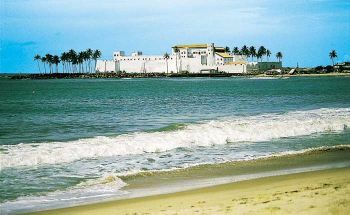 El Mina, a fortress erected by the Portuguese in what is now Ghana in 1482, was the first permanent structure south of the Sahara built by Europeans, and was the first of many facilities along the shore of West Africa designed to facilitate the growing trade between Europeans and Africans. Among the “Portuguese” who arrived on the Gold Coast to what would become El Mina was a young Italian navigator, Christopher Columbus. Originally called São Jorge da Mina, the fortress was established to protect Portuguese traders from other Europeans. It was soon commonly called El Mina (the mine) because gold was the major item sought in trade by the Portuguese at that time. At the height of the gold trade in the 1500s, 24,000 ounces of gold were exported annually from the Gold Coast. Gold from the region accounted for one tenth of the world’s supply during that period. In order to build El Mina, the Portuguese demolished many African homes in the area, leading to local resistance and rebellion. The Portuguese retaliated with force, burning the local town. A new town soon developed around the fortress, inhabited mainly by the Africans hired to support Portuguese commercial activity in and around the military outpost. Today the town, called Elmina (Edena), currently has a population of around 20,000. In 1637, the Dutch West Indies Company ousted the Portuguese and occupied El Mina. By the mid-17th century, the Portuguese had already converted the storerooms of this trading post into dungeons to hold enslaved Africans while waiting for a ship to transport them to the Americas. The Dutch continued to collect enslaved people traded by interior African states. Since Dutch vessels arrived every few months, the fortress was used to hold enslaved people. Each of a dozen dungeons could hold up to 500 slaves waiting for transport to North and South America. Often the Dutch traders and soldiers withheld food or water as punishment for rebellion or when both were in short supply and thus many of the people intended for the New World died at El Mina. The British purchased El Mina from the Dutch in 1872, and held control over the fortress until Ghana’s independence in 1957. Today, UNESCO recognizes El Mina as a World Heritage Site, and people from around the world come to visit this complex, which became one of the most important facilities perpetuating the transatlantic slave trade. Kwame Yeboa Daaku, Trade & Politics on the Gold Coast 1600-1720 (London: Oxford University Press, 1970); Christopher R. DeCorse, An Archaeology of Elmina: Africans and Europeans on the Gold Coast, 1400-1900 (Washington, DC: Smithsonian Institution Press, 2001); P.E.H. Hair, The Founding of the Castelo de São Jorge da Mina: An Analysis of the Sources (Madison: University of Wisconsin, 1994). 1400-1900 (Washington, DC: Smithsonian Institution Press, 2001); P.E.H. the Sources (Madison: University of Wisconsin, 1994).